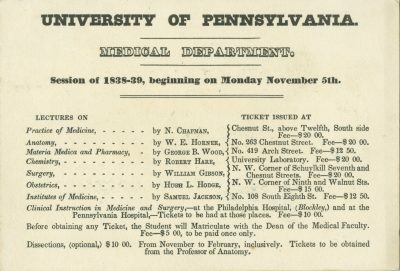 The University of Pennsylvania Archives holds a national and international collection of 1,150 medical lecture and matriculation tickets spanning the years 1765 to 1929. Of these, Penn issued 801 or about 70 percent. The remaining 349 or 30 percent represent more than 80 other institutions (medical schools, private lecturers, anatomy schools, hospitals, etc.). The collection contains tickets from 16 states and from Canada, schools in Montreal and Halifax. Geographically, the collection’s medical schools extend from Canada on the north to Atlanta and New Orleans on the South, from the Mid-Atlantic and New England coastal cities on the east to Iowa on the west. The stories associated with these tickets extend farther west to California (28) and across the Pacific Ocean to the Philippines (100). A few oddities in the collection, such as a ticket to Peale’s Museum of Natural History (42), relate to extramural medical education. Figure 1. 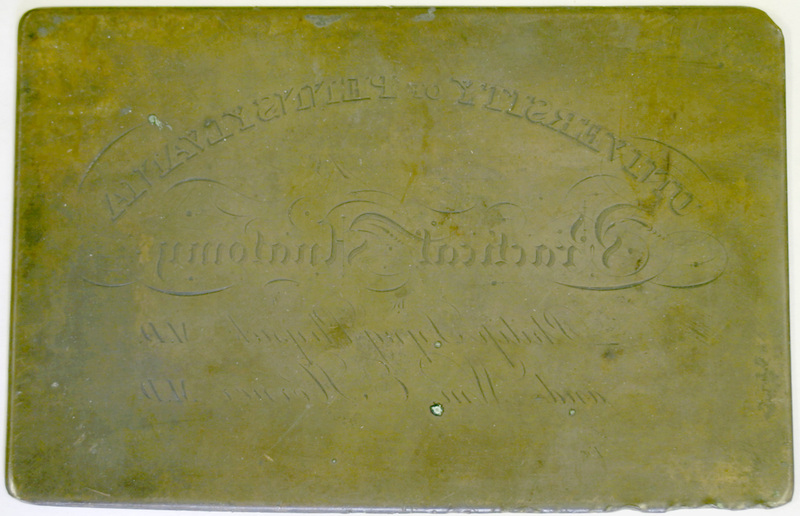 Printing plate used to make lecture tickets for admittance to Physick and Horner’s course on practical anatomy, 1831. 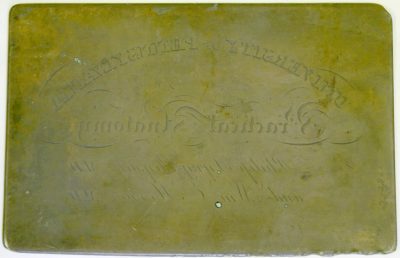 A ticket printed from this plate appears in the catalogue (80). Printing provided a myriad of choices for graphic design, not only font size and style, but also decorative elements. Select late-18th/early-19th-century tickets show the influence of neo-classical design in ribbon and fretwork borders (8, 67). Iconography, including a rare portrait (81), distinguishes some tickets. Anatomy professors offered the most illustrative tickets: imagery of skulls, as well as supine and dancing cadavers (51, 68). Institution-issued matriculation cards and hospital tickets might have featured architectural illustrations (7, 77, 79, 94, 97). Many faculty signed their names on the front or back of the card; some relied on the printed name. Students signed their names on the front. Although the faculty in some medical schools dispensed tickets with a standardized design, individuality appears to be the norm. This fit with the proprietary nature of medical education. In a complete set of bound Penn tickets from 1816, six distinct graphic designs communicate the name of the school, the course of lectures, the professor and the student (73). Green, pink, violet, orange, yellow, red, blue: by 1845 colored paper stock added to the variety of lecture tickets. Figure 2. 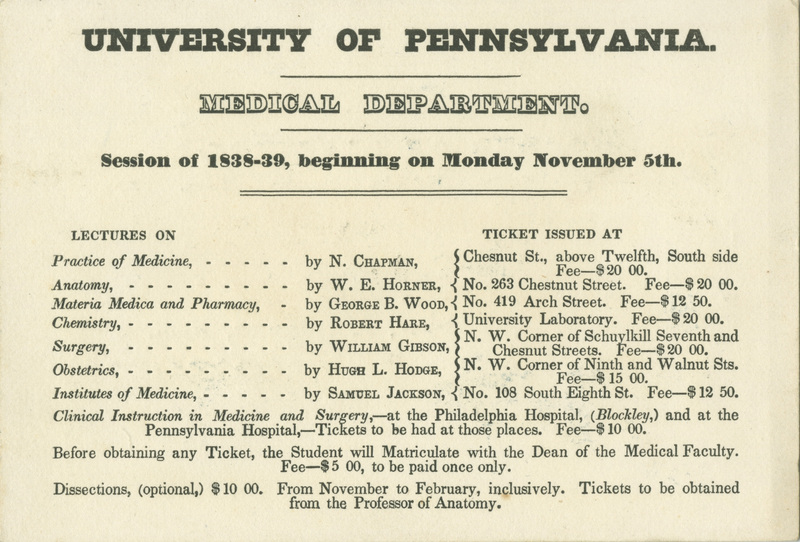 Fee schedule, University of Pennsylvania, 1838-39. Note the various locations students went to for ticket purchases from each professor. Medical students first paid a matriculation fee to the school, typically $5, as was the case at the University of Pennsylvania, Yale and the Medical Department of Pennsylvania College in the 1830s. Theoretically they took the matriculation card with them to purchase lecture tickets for each course directly from the professors – one at a time. That might have meant knocking on doors at six or seven locations and paying fees ranging from $10 to $20 per course. 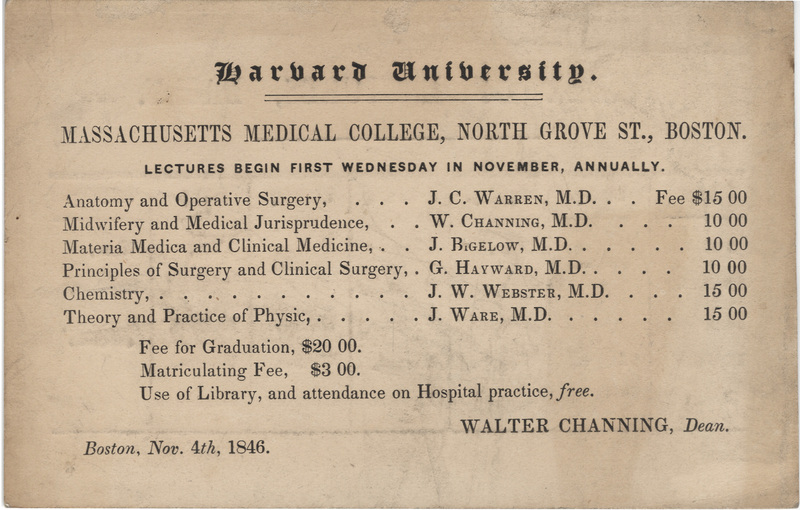 (See figures 2 and 3 for fee schedules for Penn and Harvard in the late 1830s and 1840s.) “Tuition was usually the most expensive in city schools and cheapest in the backwoods institutions where the professors had little overhead and were content with more modest fees.”4 Courses that involved more materials and equipment, such as chemistry, surgery and anatomy, tended to charge higher fees to cover the professors’ expenses. The students also paid fees to the demonstrator of anatomy, defraying costs for dissection material. Where the tickets formed the basis of admission to a course, they “were examined by an ‘usher’ stationed at the entrance of the lecture room at the early part of a session.”5 On top of lecture fees students paid $5-10 hospital or clinic fees at schools having hospital affiliations. Figure 3. 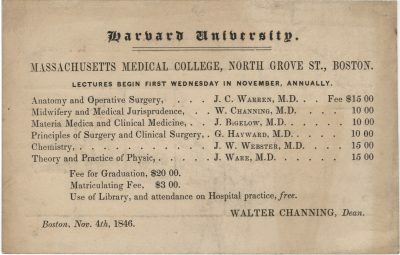 Fee schedule, Harvard University, 1846. At $3, Harvard’s matriculation fee was less than the more typical $5 of that era. Matriculated medical students were not alone in purchasing lecture tickets. Practicing physicians might have paid to take a particular course to update their knowledge; apprentices also might have taken a course to supplement their on-the-job training. But neither physicians nor medical students needed to complete the degree program, as a diploma was not prerequisite to licensing, that is, in those few places where licenses to practice were required. As to tickets in the collection representative of other medical schools, later examples illustrate the continuation of the system at Baltimore University School of Medicine, College of Physicians and Surgeons (Medical Department of Columbia College), College of Physicians and Surgeons in Keokuk, Iowa, Philadelphia’s Jefferson Medical College, Medical School of Maine (Bowdoin College), McGill College, New Hampshire Medical Institution (Dartmouth College), and the University of Vermont. However, matriculation or “general admission tickets” heavily weight the collection as of the closing decades of the 19th century. 3. Leslie B. Arey, Northwestern University Medical School 1859-1979: A Pioneer in Educational Reform (Chicago: Northwestern University Medical School, 1979), 21. 4. William Frederick Norwood, Medical Education in the United States before the Civil War (Phila: University of Pennsylvania Press, 1944), 392.